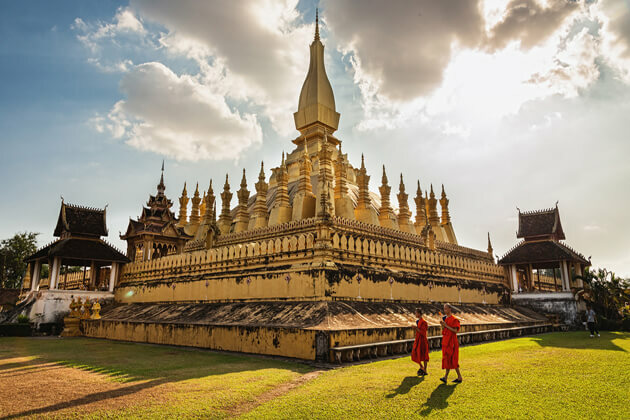 Explore the mystery of Vientiane, a bustling capital with many famous sights, with breathtaking views, sparkling temples, rich cultures, thousands of Buddhist statues, and interesting archaeological sites. 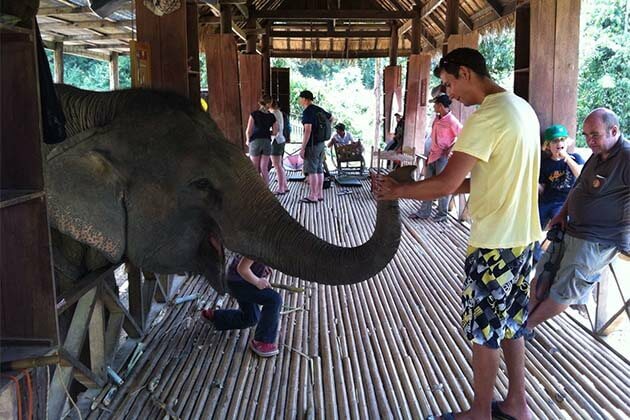 Vientiane would be an interesting stop on your Laos Tours & Packages to explore the wonderful land, “the land of a million elephant”. 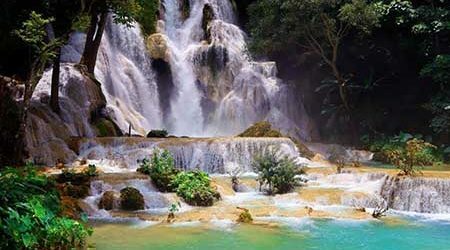 A ton of amazing experiences and activities at the heart of Laos are waiting for your visit. Consider the best Vientiane tours packages below to get closer to this city of charms and impressions in Indochina! Vientiane is such a great place for those who seek a peaceful place to escape from the vibrant life and refresh the mind and body. 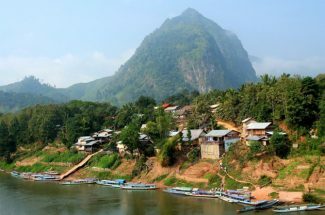 Located on the Mekong River in southern Laos, the capital of Laos offers great Buddhist art, charming temples and lovely gardens and the remnants of ancient French architecture. 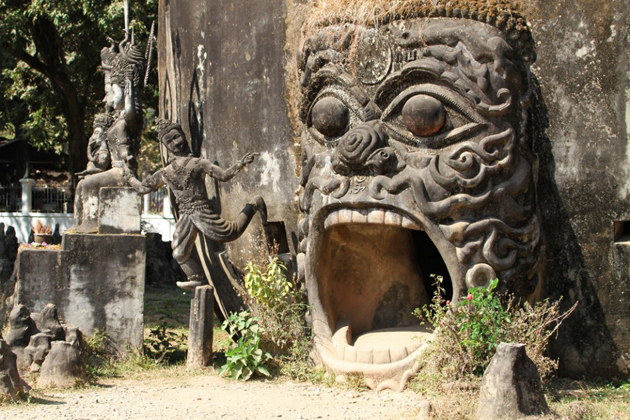 A ton of mysteries and marvelous attractions are waiting for your exploration in Vientiane tours. 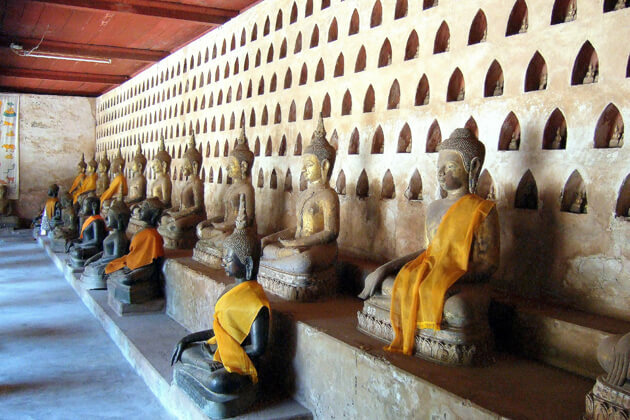 Wat Sisaket is the oldest surviving Buddhist temple in Vientiane, and also has the most mysterious temple to tell. The temple holds an inner sanctuary filled with 6,840 Buddha images of various sizes and ages, some of which are dated back to the 15th century. 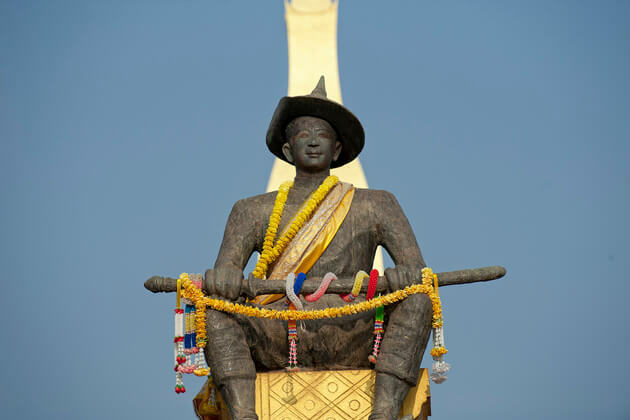 Wat Sisaket was first built in 1551 by King Phothisararat, later rebuilt by King Anouvong in 1818. When the king revolted against his lord in Siam (derogatory by the offensive treatment he received in the funeral of the king of Siam), in 1828, the Siamese army came in and razed everything to the ground except Wat Sisaket According to the Lao people, the temple's design has freed itself from destruction. Like Buddhist temples in Thailand, Wat Sisaket has a rooftop terrace and a five-story roof separating it from other temples in the Lao architecture style. It is a good idea to visit any temple in Laos or Wat Sisaket in Vientiane tours, you should wear polite attire, remove the shoes before entering the temple. Located in the east of Vientiane capital, Pha That Luang is considered to be one of the country's largest Buddhist monuments. Pha That Luang was built in 1566, is a Khmer temple construction in the 13th century and has been continuously renovated and reconstructed since then. Part of the temple was broken in the 19th century during the Siamese war, but soon afterward it was renovated. Today, Pha That Luang’s gilded stupa is an important symbol of Lao people as well as a must-visit in any Vientiane tours. It appears on the national seal and celebrates the country's most important festival, Bun That Luang, which is celebrated in three days starting in the full moon of the 12th lunar month. The stupa is closed for visitors on Monday; visitors go to Pha That Luang can also visit two nearby temples as a substitute, Wat That Luang Neua and Wat That Luang Tai. Patuxai Monument was built in the 1960s to commemorate the struggle for French independence. The Patuxai (Triumphal Arch) looks like the French statue of the Arc de Triomphe. 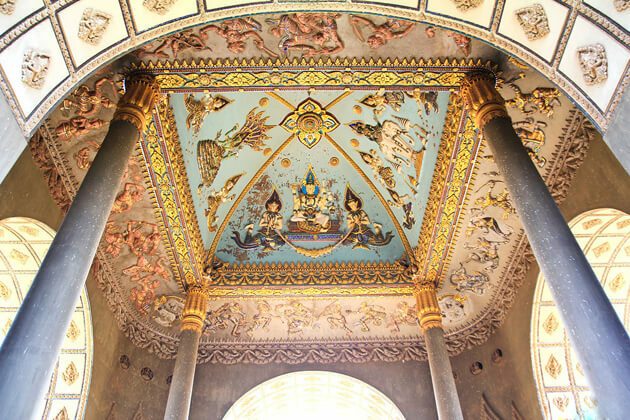 Unlike the Arc de Triomphe, the arches of Patuxai are decorated with legendary Kinnari figures. Paxtixai Monument is located in the center of Vientiane, at the end of the spacious Lan Xang Boulevard built by the French. Next, to the memorial, there is a fountain donated by the Chinese government. 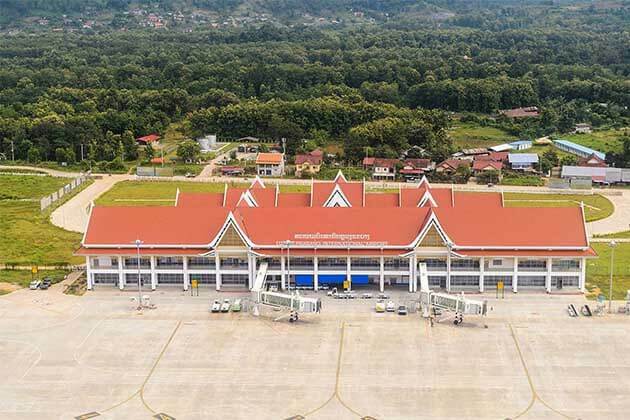 Patuxai was built with American cement which is used for construction in airport runways. To this day, the monument is called the "vertical runway" to allude to this historical reality. To climb to the top, guests will have to pay a small fee. A note for visitors to visit this place, tourists will not be allowed to take pictures. The statues surrounding the Buddha Park (Xieng Khuan) make this place less like a Buddhist temple. In Southeast Asia, there are no unique Buddhist monasteries, including the 130-foot Buddha; Indra rode elephant head; a head with four arms in the direction of the cardinal; and a three-tiered pumpkin that you can climb. The park is said to be the brainchild of Bunleua Sulilat, an artist and alleged cult leader He built the park in 1958, using reinforced concrete as a vehicle for his mystical vision to synthesize Hindu and Buddhist beliefs. 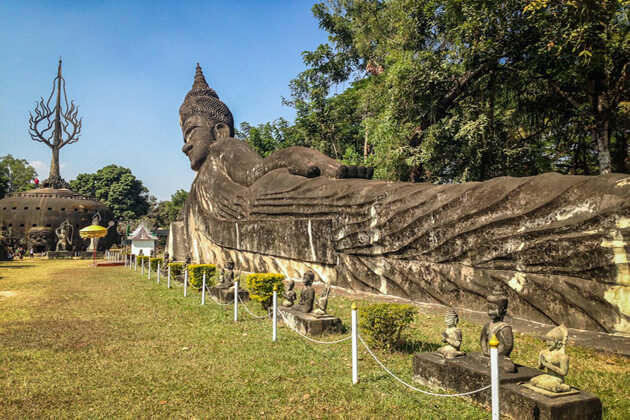 Buddha Park will completely leave your Vientiane tour of unforgettable memories. If you are looking for Western items at a higher price then better go to the new Vientiane Center shopping mall. 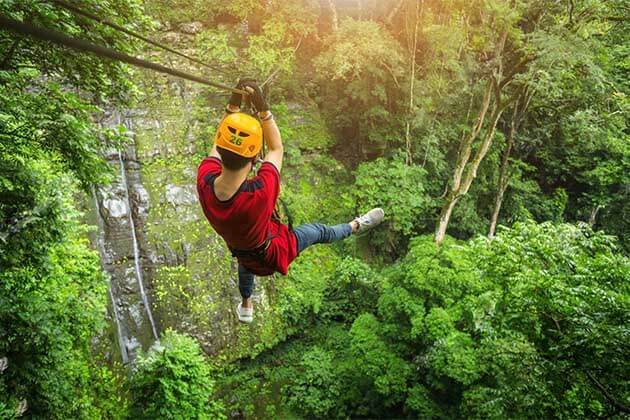 In Talaat Sao, middle-class or lower-class people can come here to buy the right product for them such as air-conditioners, sports equipment, jewelry, and cheap electronics, followed by traditional dry goods, traditional Lao handicrafts, and traditional Lao bolts and so on. As its name suggests, the Morning Market is meeting very early - from 7 am to 4 pm, local small traders living along the narrow streets of the market will give you a more reasonable price than with Riverside Night Market! To get the best deal out here, there is a little trick for you when shopping to give a fresh smile to them. The 14-hectare green space next to the Mekong River is home to sports lovers and Tai Chi groups, all enjoying the fresh waterfront atmosphere of the street food stalls. and snacks nearby. 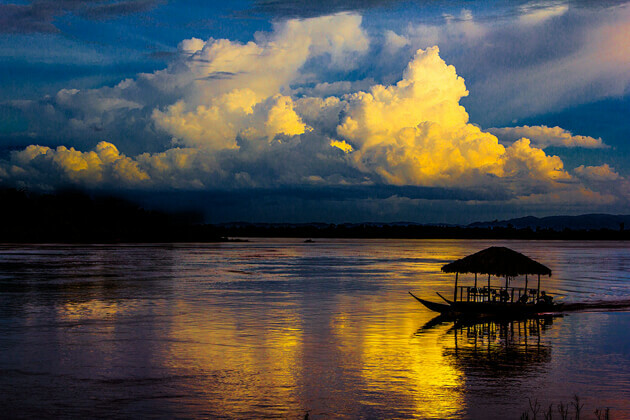 This scene is considered as a reality show that takes place when the sun sets: it is said that no word can describe the view of the sunset beside the banks of the Mekong River in Vientiane. As soon as the sun goes down, you can go leisurely at the nearby night market: buy a shirt as a souvenir or knitwear by Buddhist theme. 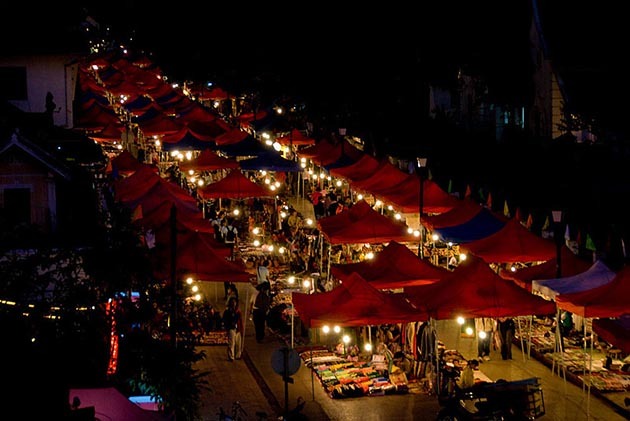 The night market is from 6 pm to 10 pm. 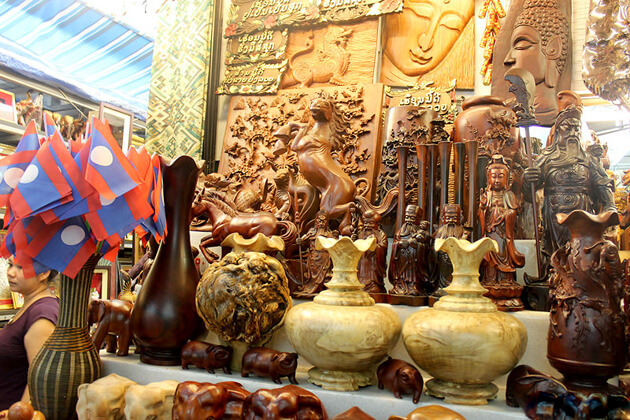 Remember to bargain before buying, and enjoy the nightlife in Vientiane tours. After dark, from Nam Phou fountain near Rue Setthathirath, you can visit some famous cafes, bars or eateries. You do not have to go long distances to the coffee grounds at Bolaven Plateau. At Vientiane, you can also enjoy a cup of coffee with no different taste than the Bolaven Plateau. Sip a bit of coffee and watch the streets of Vientiane. 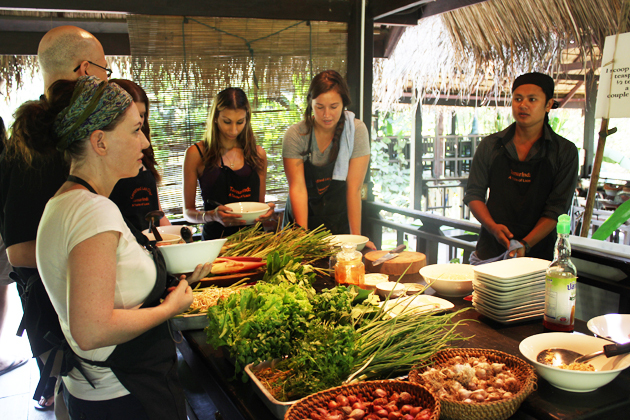 Actually, attend a traditional Lao cooking class suite to Laos family tours. 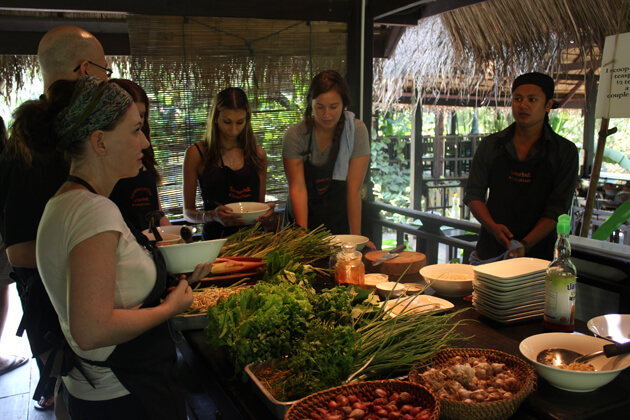 What is better than you can have an interesting experience when you take a traditional Lao cooking class. If you are a person who loves Asian cuisine as well as Laos food, then here are your chance. Generally, Laos cuisine is the same with Asian Cuisines, it’s fresh, flavourful food and add some French twist. Join a traditional Lao cooking class, you can go to the traditional market to choose the freshest ingredients and herbs by yourself. 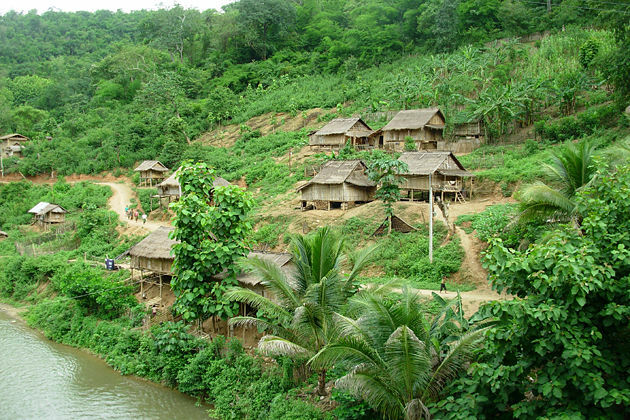 Moreover, you can learn to cook a bunch of dishes of the traditional Laos meal with a professional chef. After the end of the cooking class, let’s enjoy your dishes with your family!